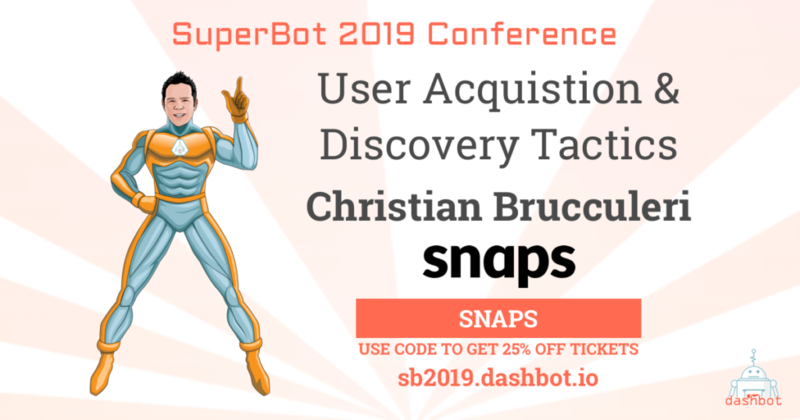 This year at SuperBot, we’re proud to have Snaps CEO Christian Brucculeri come talk about building conversational AI experiences for all kinds of different brands. Christian Brucculeri is CEO of Snaps, the conversational marketing platform that helps Fortune 500 and emerging DTC brands acquire new customers, drive conversions and improve customer experience at scale through conversational AI. Snaps currently powers AI messaging for leading companies including Nike, Nike Jordan, Michael Kors, Marriott Rewards, Starwood Resorts, Chubbies, Prudential, Foot Locker, Under Armour, Coty & VICE. Prior to Snaps, Christian ran business operations, product management and marketing for Airtime, a real-time communication platform founded by Sean Parker.Christian also previously ran investments for K2 Media Labs, a mobile-first incubator funded by a collective of media entrepreneurs from companies like ClearChannel, Lerer Ventures, Zelnick Media, and News Corp.
Christian has been published for his thoughts on mobile, technology, artificial intelligence marketing and advertising in The Wall St. Journal, Financial Times, Forbes, AdAge, VentureBeat, Mobile Marketer, and others. Read more about Christian here.